A new edition of the acclaimed anthology—the most comprehensive collection of twentieth-century poetry in English available. "The most acute rendering of an era’s sensibility is its poetry," wrote the editors in their preface to the first edition. Thirty years later, this innovative, cover-to-cover revision renders with fresh eyes and meticulous care the remarkable range of styles, subjects, and voices in English-language poetry. The newly titled Norton Anthology of Modern and Contemporary Poetry—now available in two paperback volumes—includes 1,596 poems by 195 poets (half of the poems are new), from Walt Whitman and Thomas Hardy in the late nineteenth century to Anne Carson and Sherman Alexie in the twenty-first. 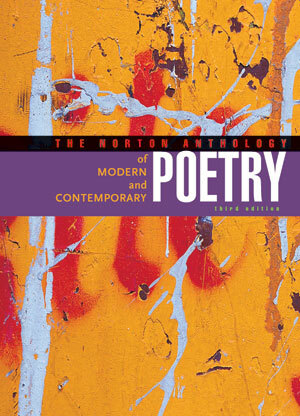 The Norton Anthology of Modern and Contemporary Poetry continues to be the most comprehensive collection of twentieth-century poetry in English. It richly represents the major figures, while also giving full voice to ethnic American poetries, experimental traditions, postcolonial poetry, and the long poem, eclipsing all other anthologies in scope, clarity, and balance. Drawing on a wealth of new and recent poetry, as well as recent scholarship, Professor Ramazani has reconsidered every poem in the anthologies. The Third Edition provides an unprecedentedly rich selection of world poetry in English, opening new possibilities for instructors who want to teach a truly anglophone poetry course. Likewise, fresh attention to experimental poets in both volumes gives new breadth and balance to the collection. In-depth attention to major poets and major poetic trends—beginning with the “precursors” Whitman, Dickinson, and Hopkins—and generous selections, often demonstrating the span of a career, continue to be key principles of selection. Representation of many canonical figures, especially women and African American poets, has been increased—among them Auden, Bishop, Clampitt, Crane, Eliot, Ginsberg, Glück, Harrison, Hayden, Heaney, Hughes, Larkin, McKay, Merrill, Moore, Owen, Plath, Rich, Roethke, Stevens, and Walcott. Each volume now concludes with a new poetics secton of influential statements by poets. Many of the headnotes and annotations, and all of the bibliographies, have been entirely rewritten. New volume introductions outline cogently the varied and interconnected movements of twentieth-century poetry. Now more portable, the anthology is available in two paperback volumes: Volume 1, Modern Poetry and Volume 2, Contemporary Poetry.